Jeff Heotzler Racing | The Home of "The Jeffer"
The all-new JHR T-Shirts and Hoodies are here! All prices INCLUDE shipping. We hope to see everyone sporting their black and white JHR apparel at the track! Click Here To Visit The JHR Shop! The Jeffer Gives A Trackside Interview During Eastern States Weekend – Thanks to Extreme Energy Solutions! The Jeffer put the Extreme Energy Solutions, Four Star Motorsports J17 on the front row for the prestigious Eastern States 200 at the Orange County Fair Speedway, earning him the $1000 Outside Pole Award. The Jeffer’s day came to an early end when an engine failure sidelined the J17 on lap 40. Although disappointing, The Jeffer showed the big block modified world that he still is a force to be reckoned with. The Extreme Energy/ Four Star team will be back better than ever in 2019. The Jeffer Scores 53rd Career Modified Win and $6,000 Payday at OCFS! MIDDLETOWN, NY – A battle between two of the most iconic Modified drivers in the history of the Orange County Fair Speedway took center stage last Saturday evening as the track presented its final regular season program of the 2018 racing campaign. Jeff Heotzler Sr. and Richie Eurich, who are only two of four drivers to crack the 50-win barrier during their illustrious OCFS careers, brought the crowd to its feet with another barnburner as they fought for the first-place prize of $6,000 in the 30-lap main event. When the dust settled, Heotzler raced home with the 53rd victory of his OCFS career after chasing down Eurich, who dominated the race for so many laps. Eurich, meanwhile, started on the pole and was enjoying a comfortable lead over Brendan Finley, Heotzler, Donnie Wilson and Gary Edwards Jr. throughout the event. But Heotzler was finally able to work himself past Finley on the 26th lap and then quickly turned his attention to Eurich. Heotzler closed in on Eurich during the next circuit around the five-eighths mile, hard clay oval and then found an opening while racing off the second turn on the 28th lap. He moved past Eurich down the backstretch and then went on for the win. Eurich, who has 50 career wins to his credit, settled for a second-place effort with Finley, Tommy Meier, Stan Frankenfield Jr., Edwards, Craig Mitchell, Brian Krummel, Mat Williamson and Jerry Higbie rounding out the top 10. MIDDLETOWN, NY – Jeff Heotzler Sr. carved another notch into his racing belt at the Orange County Fair Speedway last Saturday night as he drove to his 52nd career Modified victory at the historic track in the 30-lap main event. Heotzler, who has struggled throughout the early season, feels he may have finally hit on something good as he took control of the race from the second lap and never looked back. “Finally, I think we might have something here,’’ said Heotzler. “We’ve been working to get the right set-up for this car and really missed on it a week ago with the new track surface. But I think we’re finally pointed in the right direction. Heotzler, after starting on the pole, surrendered the lead to Kirk Horton at the drop of the green and raced in second for one lap. However, he powered past Horton following a second-lap restart and never looked back. The Jeffer Scores 51st Career OCFS Big Block Victory! The Jeffer put the Extreme Energy Solutions/Four Star Motorsports Teo Pro Car in victory lane on Saturday night after taking the lead on an early restart and never looking back! The win was much needed after a series of bad luck plagued the team over the last month. The Jeffer looks forward to getting back at it again next Saturday on the Hard Clay. 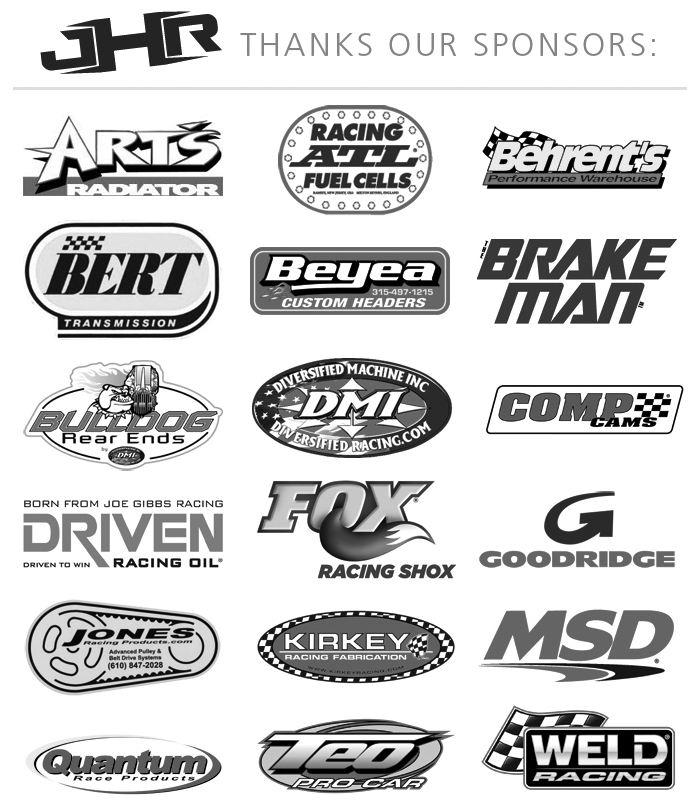 Thank you to all of JHR’s sponsors and supporters to continuing to make the dream a reality! The Jeffer Finishes 3rd on Opening Night! The Jeffer drove the Extreme Energy Solutions/Four Star Motorsports TEO ProCar to a solid 3rd place finish in the 30 lap feature on Saturday night. The team looks to build on that success this upcoming Saturday! The official start to the 2017 racing season at OCFS will have to wait another week as rain forced the cancellation of Saturday’s (22nd) opener. We’ll see you all next week! We’re happy to unveil the 2017 Extreme Energy Solutions / 4 Star Motorsports J17 Big Block Modified! Design and Wrap by Gravity Designworks Inc. – Check em out!